With the challenge accepted, they both laughed and giggled like children as they descended just a little too fast toward the surface. Both ended knee deep in the warm sands which encircled the island. They floated through the white billowing clouds of mist which hovered over the lush green of the Atlantean mountains. Elizabeth observed the blue sea rhythmically lapping against the white beaches. She marvelled at the unique and curious variations in climate and terrain which were refreshingly different yet barely noticeable on her high vibrational body. She was delighted to be on the planet, for it already felt like home. She could sense her friends throughout the planet and knew that in the twinkling of an eye she could visit them. Everything was so new and fresh, she wanted to explore it all at once, to touch, to feel, to taste, to become one with her new environment. She longed for her physical body to become more dense, as a child awaits maturity, and with about as much impatience. She knew it would take centuries upon centuries for her body to be able to fully experience this physical world. For now, she had to be content with knowing that each time she merged or became one with the creations of Earth, her goal became just a little closer. The seasons were as hours and the years as days as she and the others experienced this new concept of time. Time had little meaning for them in their newfound playground, as they romped and rejoiced like children experiencing a magical land. Already a few centuries had passed, and Elizabeth had become more skilled at touching physical surfaces. She would giggle when her hand passed through a tree or rock if she was not concentrating. One warm, sun-filled day a millennium after her arrival, she decided to test herself and experience what it would be like to merge her consciousness with a rock. She glided over the landscape in search of the ideal formation for her experiment. She drifted along the white beaches, looking at each potential rock as one might observe the delicacies on a table set for a great feast. She knew it was one thing to pass through an object‹it was another thing to touch it and, even greater yet, to become one with it. So this was not only a challenge to her physical senses, but a challenge to her conscious awareness. From the moment Elizabeth arrived on the planet, she had realized she could not fully comprehend the third dimension without becoming one with it. The question which gnawed at her soul was, Are we here as guests or family? The question perplexed her and the answers swimming through her mind confused her. She wondered, Are we in it or of it? She hoped to soon find out. Elizabeth had chosen a rock because it was the densest and most foreign to the concept of consciousness. She was aware John had merged with a tree. Determined to choose an even greater challenge, she smiled at the ongoing yet friendly competition between them. Allowing her foot to dip into the waves as she effortlessly glided along the ocean’s edge, she thought she could feel the press of the wind against her body ever so slightly. Noting that her foot left no wake, she longed for the day when the wind would toss her hair and her touch would ripple the waters. She focused her attention on Atlantiana, the largest island of Atlantis, whose vast northern white beaches were scattered with various rocks and boulders, many jutting into the ocean. She found them all fascinating, some but a few hundred pounds and others hundreds of tons. 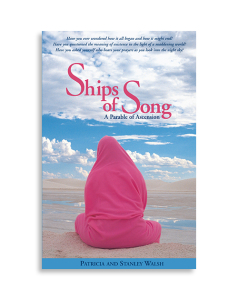 She saw each of them as unique, pink crystals sparkling in the spray of the sea. Each had been torn loose from the granite bedrock beneath the island during its formation. Elizabeth was humbled by their beauty and the creative power they represented. Gliding among these natural sculptures, Elizabeth passed through a cluster of smaller formations. As she rounded the last one, she found what she was looking for. Jutting out from the water’s edge was a magnificent boulder fifteen feet high. She floated admiringly around it. It delighted her. She could see the waves crashing against its massive body, spray dashing across its surface, promising a multitude of sensations. Its form was a symphony of textures and shapes smoothed by the ocean’s touch, but jagged and cracked where the waves were unable to reach. This sparkling pink monument called out to her soul. And then beyond her fondest hopes‹she saw it! There, in the loving bosom of this wonderful creation, was a pool of water. So overcome with the grandeur and beauty of this gift from the earth, an unexpected sigh passed her lips. With the thrill of anticipation she thought, In merging with this great rock, I’ll be able to hold the ocean before my time. She smiled as she watched the waves lap unhindered through her bare feet as she stood ankle deep in the crystal clear water. Though her senses were still muted, she trembled as she reached out to gently touch the cool stone. Focusing all her concentration, she stroked this magnificent being, gently touching its surface as a mother might lovingly touch her child’s cheek. Her fingers sought to feel the coolness of the rock, as one touches the cold of winter through a pane of glass. Even though she could pass her hand through the rock without a thought, it was far more difficult to maintain her touch on its surface. Stopping at an object’s physical edge took extreme concentration and sensitivity to energy. A grin flashed across her face as she thought of the years ahead when the opposite would be true‹when she would have no difficulty touching physicality but would have great difficulty getting through it. No matter how physically limiting the third dimensional experience would become, she was like an adolescent waiting to grow up. Far in the back of her mind, though, she knew the day would come that as an ‘adult’ she would wish to be a child again. Briefly it entered her mind to question what the effects might be to lower her vibrations to such a level, but the thought was quickly dismissed by her youthful enthusiasm to merge with this glorious creation. As a young maiden awaiting the passionate embrace of her lover for the very first time, she knew there was no turning back. Spring, summer and fall had come and gone on the island of Atlantiana and her hand had moved but an inch upon the stone. She allowed her fingers to lightly flow over the curves and ridges, seeking to sense the most minute changes in its direction and form. She savored each variation as a sweet morsel of delicate sensations. Over the following year, she became quite adept at allowing her fingers to journey across the mountains and valleys of its surface. A decade passed while Elizabeth kept her vigil. Exploring this object of her affection, she examined every ridge and curve, both above and below the ground. She knew it and loved it as she knew her own body and, just as her body was changing through the years, she became aware of the minute changes in the rock¹s form and shape caused by the ocean¹s unceasing onslaught. Undistracted by the need for food, water or sleep, she dedicated all of her energies to her quest. When she needed rest, she simply quieted her mind into a meditative state. During one of these rest times, she remembered the time when, in her enthusiasm to touch a scurrying rabbit, she had put her hand right through the small creature, nearly scaring it to death. Smiling, she recalled her penance, a large patch of sweet clover created by her thoughts. Her gift was readily accepted, forgiveness given and they each went on their own way. She recalled on a particularly warm, moonlit night having seen the great ship in the heavens. Speaking to Michael, she had invited him to experience this precious rock through her thoughts. He readily accepted, as her hand caressed a particularly textured formation in the rock. Now adept at touch, her contact with the cool, moist surface was particularly strong. Sending a resounding Ohm throughout the heavens, Michael acknowledged and gave thanks to his friend. Elizabeth was ready. The time had come for her to become one with the earth through this rock. She had been a good student and had learned her lessons well. She had only come upon this great work of art forty years ago. ‘Quite expedient.’ She smiled to herself. ‘I’m a quick study.’ She had learned a lesson that would later be forgotten by humanity and would take eons to remember‹to become one with something, you must first observe it fully, know it completely, honor it unceasingly and respect it totally. The moment had arrived. Her yearning to become one with this creation was to become a reality. She was aware of the rock’s willingness to participate in her adventure, and with gratitude, she stepped into it. For years she had studied the exact place within the rock where she perceived she would experience the most delight. Now totally encompassed in pure pink granite, she sat cross-legged, cupping her hands around the water-filled bowl created by the waves. For twenty-eight years, moment by moment, hour by hour, day by day, month by month, year by year, the creator and the creation became one as she sat in the bosom of the rock in quiet stillness. It was impossible to distinguish a separation between herself and the object of her love, for their consciousnesses had joined. She knew the thoughts of the rock, its yearning to become one with the sands of the beach‹its brothers and sisters. To her amazement and delight, in this union she had become one with each grain of sand. In becoming one with the rock, she had become one with the tree, the bird, the sea, the earth itself. Upon her hard stony face, she could feel the spray of the ocean imperceptibly tearing her down. She could feel the very heartbeat of the Mother, resonating through the rock firmly implanted thirty feet below the surface. She could feel the pool of water in her hands, refilled by the waves overflowing from the sea, as a gift and an offering to her. She thanked the rock, the earth, the sea and the wind for what she had learned‹the oneness of all creation. Never before had she felt so complete, so whole and so at one with herself, this world and the universe. Each year their union became stronger. She learned how to honor change and adjust accordingly. She came to understand the cycles of existence in this garden and willingly gave up morsels of her body to be devoured by the sea, knowing that nothing was lost. It amazed her that some of her was now a thousand miles away, drawn by the tides and the currents to grace other beaches. She had come to understand that nothing was ever lost, only changed. Physicality was a vibrant, moving exploration of itself in which the ingredients would have the opportunity to experience everything in creation. She realized that a single drop of water would become part of the sea, would pulse through the veins of a tiger, or fall as a raindrop, or a tear. What a wonderful adventure this world was and, indeed, it was good. About a century and a half after her union with the rock, a great storm arose. As the waves submerged her being, she could feel tiny particles of sand being thrown against her body like needles. As a matter of fact, some of the particles were from herself. The winds calmed and the skies cleared as the dark, threatening gray clouds turned into white puffs of cotton in the sky. She had experienced and lived as the earth. She had felt the butterfly land on a twig on the far side of the globe. She had held the little crabs, laughing and giggling as they climbed over her body, their tiny feet tickling her as they rejoiced in the pool of water she held for them to play in. That same pool of water became a dinner plate for a seagull as it devoured her little friends, the crabs. She had experienced an entrapped fish die of starvation in her hands and she felt that same life return ten thousand miles away in an inland cove. As energy cycled through her body, so did the seasons and the return of life upon this great planet. She remained one with the rock for a thousand years, and it was now time for her to depart. She had experienced what she had desired to learn, and she bid farewell to her host. Thanking Earth and kissing the rock with her consciousness, she stepped out. As she did, she heard a little splash and turned just in time to see a slight ripple in the water by her feet. She moved her foot again but no ripple was seen. Was it her imagination? She didn’t think so, and the rock agreed.